The Grit and Grind Grizzlies may be reaching the end of the line in Memphis, and Alex Theoharides (@Minne_Pop) examines why. We have reached the point in the NBA season where teams can be divided into definite playoff teams, potential playoff teams, and definite lottery teams. The Memphis Grizzlies are one of the most difficult teams to classify. The Grizz had an eventful 2012 season. Last August, the team was sold to billionaire Robert J. Pera and a team of bros headlined by Justin Timberlake (you know, this guy). One of Pera’s first moves was to hire ESPN stat whizz John Hollinger in December to be the team’s Vice President of Basketball Operations. A month later, the Grizz traded Rudy Gay to Toronto in a deal that essentially netted them Tayshaun Prince and Ed Davis. The deal was controversial because of Rudy Gay’s unique position in the game behind the game: stat heads hate his inefficient offensive shooting numbers, former ballers, like then head coach Lionel Hollins, appreciate his diverse skill set and overall talent. Despite Hollins and team management butting heads throughout the remainder of the season, Memphis managed to finish fifth in the Western Conference. Led by Defensive Player of the Year, Marc Gasol, Zach Randolph, and Mike Conley, the team won a tough series against the LA Clippers in the first round of the playoffs, before easily beating a depleted OKC Thunder in the second round. Then they ran into the buzz saw offense of the San Antonio Spurs in the Western Conference Finals and were swept in 4 games. As a Wolves’ fan, I tend to view all other teams through the lens of my fandom. Essentially, I want to know if they will help or hurt the Wolves’ chances of making the playoffs. Going into this season, it was clear that in a loaded Western Conference at least two teams would need to slip in order for the Wolves to make the playoffs. So far, the Grizzlies have been one of those teams. In the off-season, they essentially fired head coach Lionel Hollins and replaced him with lead assistant, David Joerger. Joerger is held in high regard in the basketball community, and he was given a great deal of credit for the Grizzlies’ success over the previous few seasons. However, firing a head coach after he leads the team deep into the playoffs usually signals a changing of the guard. The insinuation was that Memphis had reached its peak under the current regime and needed to start planning for the future. Going into the season, Memphis had largely the same lineup as last year. However, their biggest issue has been injuries. In November, Marc Gasol underwent an MRI that revealed a MCL strain in his left knee. The MCL strain did not require surgery, but it did require Gasol to sit out indefinitely while his knee healed. Without Gasol in the lineup, the Grizzlies lack potency on offense and their captain on defense. They have also dealt with an injury to Quincy Pondexter, who is set to miss the remainder of the season with a stress fracture in his foot. Despite possessing the geekiest name in NBA history, Pondexter was an important piece for the Grizzlies due to his ability to stretch the floor on offense. Even banged up, the Grizzlies are still a talented and gritty team. However, at 10 - 13 they have the third worst record in the conference. Their status only got worse Sunday night when Mike Conley bruised his thigh against the Timberwolves. Although it’s still relatively early in the season, Memphis’ probability of making the playoffs may have already slipped away. In fact, according to Vice President, John Hollinger’s numbers, they only have a 2.0% chance of making the postseason. The NBA is a mercurial league, particularly for small market teams. The smart teams (and Memphis is a very smart team) know that there is little value in being average. I have watched too many Wolves’ teams fall apart over the holidays not to see Memphis’ fall coming. Look for the Grizzlies to go on a long and brutal losing streak over the next few weeks, followed by team management exploring trades for veterans such as Zach Randolph, Tony Allen, and Jerryd Bayless. Some fans will struggle to forgive the team for breaking up the “Grit and Grind” squads of the past two seasons, but ultimately it is in the best interest of the Grizzlies to begin to plan for next year. Mike Conley is one of the most dynamic point guards in the league. The Grizzlies don’t need to look far in their hypothetical rebuild. 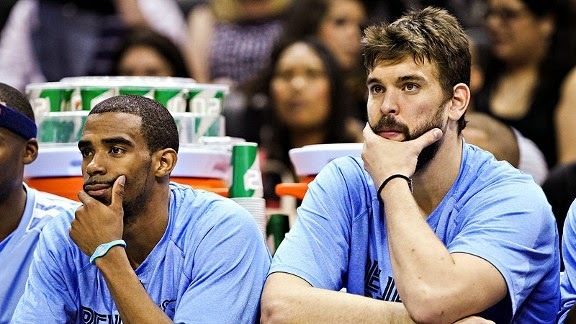 Any team built around Marc Gasol and Mike Conley will be successful. If I were building an NBA team, I would rather have Chris Paul than Tony Parker as my point guard. With that being said, in San Antonio’s system Tony Parker is a better player than Chris Paul is on the Clippers. Ricky Rubio has been more aggressive from the field of late. In the last four games, he is averaging over 15 points on 42% shooting. While these numbers aren’t gaudy, they are an improvement for a player Zach Lowe revealed is on pace to be the worst shooter in NBA history. Marco Belinelli was quietly one of the biggest moves in the off-season. He was a key player for the Bulls last year, who was able to give them an offensive threat without Derrick Rose in the lineup. This season, he has fit seamlessly into the Spurs’ system, with an insane effective field goal percentage of 64% (credit: Basketball-Reference.com). I don’t know who half of the players on Philly’s roster are. Although they have played well, this has to be one of the most blatant examples of a team tanking in recent history. What’s happening in Golden State? Earlier this year, they looked like a legitimate contender. But ever since Andre Iguodala went down they have struggled. In December they’ve lost 4 times, including two losses to Houston, a loss to Charlotte, and a loss to Phoenix. Hollinger’s numbers only give them the 8th best probability of making the playoffs in the West. And rumor has it that David Lee might be on the trading block. The best player I’ve watched this past week is Kevin Love, who is keeping the Wolves’ offense alive despite Kevin Martin’s knee injury and the team’s overall woeful shooting numbers. He scorched the Spurs for 42 points and completely dominated Zach Randolph on Sunday night. The worst (good) player I’ve watched is Josh Smith. He looked lost against the Wolves, struggling to space the floor on offense and struggling to defend wing players on defense.